When you see the term “financial independence”, what do you think of? Do you think about moving away from home, and getting out from under your parents’ wing? Paying your own way through college? Separating your finances from your spouse’s? And we’re not talking about your basic retirement planning here. There’s no qualifier at the end of that sentence like “…as long as I don’t live to 100 years old.” Financial independence is a sustainable method of putting your money to work. Sound far fetched? It’s not! Becoming financially independent isn’t nearly as difficult as it sounds. All it takes is changing your relationship with your money. Make sense? Financially independent folks are those who make enough money through passive income streams (investments, in this case) that they don’t have to work any more. They are set for life with enough money rolling in every month to cover their normal living expenses. So how to you get there? Sounds like it would only take a few million dollars, right? Or some other pie-in-the-sky number? Income. Expense. Basic terms, but so much is wrapped up in how they are used. Some of us have modest incomes, and we generally have expenses that closely match. Others of us have much larger incomes, and (strangely enough) our expenses generally match as well. For the sake of argument, let’s separate those two for the moment. Think about your expenses by themselves, and think about what you could possibly do without. Cut the clutter out. Especially if you’re planning to live life without having to work a job. I mean you could get rid of cable for that, right? What could you do to drive your expenses down, as far as they could go? How can you become less of a consumer? Could you eat out less often? Cut off services you don’t need? Find some cheaper car insurance? Downsize your home like I did? Get some new friends? OK, that one’s a little extreme, but these are the kinds of questions you should ask yourself! And don’t forget that your current job creates quite a few expenses as well– those might be eliminated if you were financially independent. OK! Once you have an idea of what your expenses could be like if you were down to the basics, write that down and multiply it by 12 to get your annual expense number. Got it? Is it $50,000/year? $35,000? $20,000? Whatever the amount, keep it handy. This is the amount your savings would need to provide you with, each year that you’re financially independent. The other side of the equation is not just about income, though that’s certainly a large part of it. Think of your income purely as savings. Don’t consider your normal monthly bills or expenses. Imagine ALL of your income going directly into a savings account or into an investment account. How much do you think you could get into that account in a year? Obviously your salary would go in there, but what else? Do you have other money you could add? Could you grab a side job in order to throw a bit more into that account? And don’t just think about it for this year, think about what you could do in years to come. The more income you can generate, the more quickly that savings account is going to grow, and the sooner you’ll become financially independent. During the year (or maybe at the end of it) you would have to withdraw some in order to fund your living expenses, but if you think about it purely as savings, your income level becomes much more exciting and your spending level much more painful, because once you have your money in an account that’s working for you, it’s hard to bring yourself to take it out. You want to see that cash working! Building your FI capital! If you could do this year over year, adding money to the account, earning interest on that money (which stays in the account) and only spending what you needed to, you would make some very quick progress. Here’s an example based on a couple earning $60,000 a year after taxes. They work on their expenses and find ways to keep them down around $30,000 a year, leaving them $30,000 (year one) to store away. We’ll discuss savings and investment options in a future post, but for right now let’s say they average 7% interest while they are working, but only plan on removing 4% of their savings each year while financially independent. How long will they have to work? Want to learn more about financially independent thinking? Check out these articles! Well, assuming that they both get raises each year and maybe find some small ways to earn a bit of extra income on the side, it’s easy to imagine them increasing their income by $40,000 in the next 15 years. As you can see, their Crossover Point (highlighted in yellow) would occur after just 12 years of work. 12 years! At the end of 12 years they would be able to collect $31,500 per year in income from their investments if they only take 4% out. And of course, assuming that their account continues to earn at least 4% each year, this number doesn’t change! The account balance stays up around $800,000 and they continue to live off the proceeds as long as they like. Here’s another scenario using a graph. Let’s say that you’re in the “higher income” category, and your household income is around $120,000 after taxes. 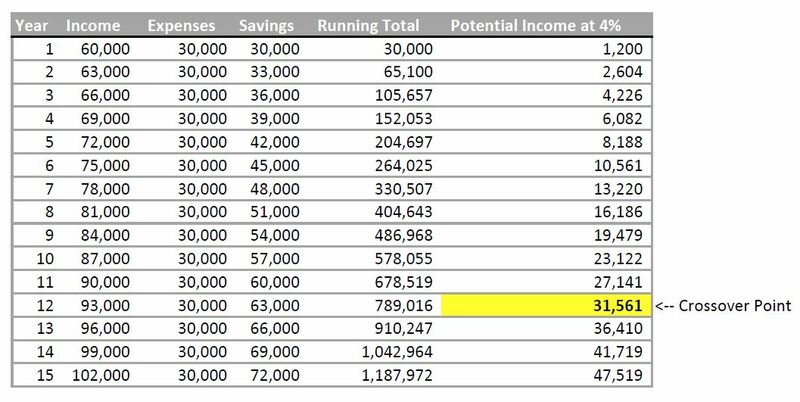 If you were able to bring your expenses down to $40,000 per year you could become financially independent in 8-9 years! 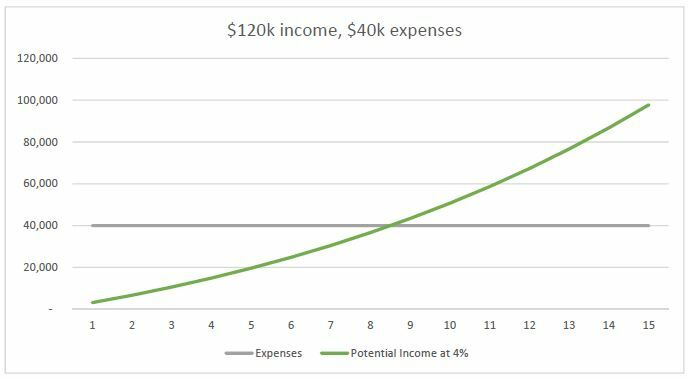 And look at the curve of the graph, if you give yourself an extra year or two your income could be as high as $60,000 per year. For life! So there you have it. I hope this is a compelling argument for reducing waste in your life and putting your money to better use for yourself. If you want to become financially independent, you’ve now got the road map! For some folks it can be done in just a few years. For others it will take 15-20. But all of us have the opportunity to go after it, no matter our age, if we consider the impact of reducing our expenses for the long haul. Have you ever wanted to become financially independent? Why or why not? And if you’re already working on an FI plan, what’s your timeline look like? This post is the first in the FI 101 series. 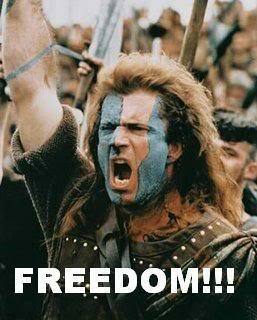 The next post is here, if you’re interested: Why you should aim for Financial Independence.